Sharpness remained positive the majority of the time. Most of the movie appeared more than acceptably concise and well-defined. Some moderate softness crept into the image at times, but not with great severity or frequency. I noticed no jagged edges, shimmering, or edge enhancement. Print flaws weren’t much of an impediment. Grain was quite noticeable, and I saw moderate density of specks and marks. Nonetheless, these stayed within reasonable levels for an older movie. When I examined the Dolby Digital TrueHD 5.1 remix of Part 2, I felt it offered a satisfying piece. As was the case with the track for the first flick, this one focused on general atmosphere. Not much else happened here, and surround usage tended toward support. I noticed a few unique elements in the rear speakers – like a barking dog in the right surround – but most of the time those channels just reinforced material from the front. How do the picture and sound of this Blu-ray compare to the Special Edition DVD release? The Blu-ray clearly came from the same transfer used for the SE DVD, so both seemed very similar. Audio was virtually identical, and visuals showed only minor improvements. Given the movie’s roots, many scenes never looked – and never will look – very good; Blu-ray can’t fix that. Daylight shots tended to appear quite lively and crisp, while nighttime scenes were murkier. This was the case with the DVD and it remained true for the Blu-ray. All of the extras from the SE DVD reappear here. Inside Crystal Lake Memories runs 11 minutes, 16 seconds and provides an interview with Memories author Peter Bracke. Conducted by Dark Delicacies owner Del Howison, they discuss why Bracke decided to write the book, his research and the writing process, his approach to the material, aspects of Part 2 and thoughts about the series’ enduring appeal. 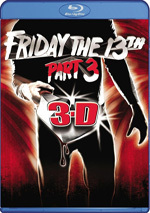 Like many sequels, Friday the 13th Part 2 does little more than remake its predecessor. However, it does so in a satisfying way, as it presents a discernibly more dynamic and visceral experience. The Blu-ray offers generally positive picture along with good audio and a minor set of extras. 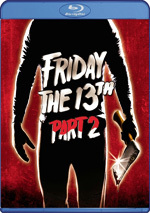 Friday the 13th Part 2 probably won’t win over any non-fans, but it acts as a decent entry in the series. If you’re a fan and you don’t have the 2009 SE DVD, you might as well pick up this Blu-ray. Room for improvement remains, but the Blu-ray provided the most attractive home video version of the film to date. However, I don’t think it tops the DVD to a strong enough degree to warrant a “double dip”. Both featured the same transfer, so while the Blu-ray boasted moderate increases in definition, it didn’t blow away the 2009 DVD.